Pass percentage & Toppers of Chartered Accountants Final Examination (Old and New syllabus) held in November, 2018, Foundation Examination held in November, 2018 and Common Proficiency Test (CPT) held in December, 2018. Since December 1949, the Chartered Accountancy Examination is held twice in a year in the months of May/June and November/December. I. 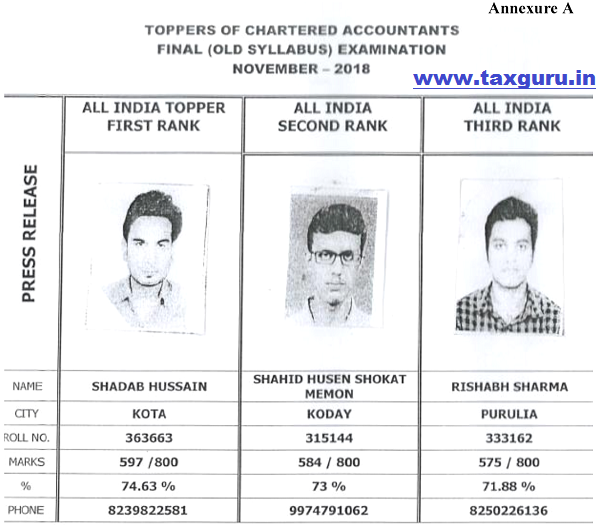 Details of top three rank holders on All India Basis for Chartered Accountants Final Examination (Old Syllabus) held in November, 2018 are mentioned below and also attached at Annexure-A. II. The result analysis of the Chartered Accountants Final Examination (Old Syllabus) in terms of number of candidates appeared, number of candidates passed and the pass percentage is mentioned in the Annexure-B. Consequent to declaration of result as mentioned above, 13909 candidates qualified as Chartered Accountants. For your reference, placed below is the data for Chartered Accountants Final Examination held in November, 2018. II. The result analysis of the Chartered Accountants Final Examination (New Syllabus) in terms of number of candidates appeared, number of candidates passed and the pass percentage is mentioned in the Annexure-D.
Consequent to declaration of result as mentioned above, 1060 candidates qualified as Chartered Accountants.For your reference, placed below is the data for Chartered Accountants Final Examination (New Syllabus) held in November, 2018. The above details are also attached at Annexure-E.
II. The result analysis of the Foundation Examination in terms of number of candidates appeared, number of candidates passed and the pass percentage is mentioned in the attachment at Annexure-F. The details of percentage of candidates passed in the above said examination are given below. III. For your reference, placed below is the data for Foundation Examination held in November, 2018. I. The result analysis of the CPT Examination in terms of gender and total pass percentage is mentioned in the attachment at Annexure-G.
II. For your reference, placed below is the data for Common Proficiency Test (CPT) held in December, 2018. THERE IS NO JOB PROBLEM,THIS INDICATES FROM HUGE NUMBER OF NEW STUDENTS COMING FOR DOING CA.THERE ARE LOT OF JOBS FOR FRESH CAs LIKE FINANCE,GST, INCOME TAX,INTERNATIONAL TAXATION ,JOB IN INTERNATIONAL FIRM IN ABROAD ALSO.CONGTARES TO NEW CAs. One Question: where are the Jobs???? I believe the percentage passing percentage is too high although industry don’t have jobs right now. feeling Proud of rank holders also from CHHATTISGARH.Congrats to all suceessfull candidates and best wishes.